September 22, 2016 07:30 ET | Source: Ivanhoe Mines Ltd.
KOLWEZI, DEMOCRATIC REPUBLIC OF CONGO--(Marketwired - Sept. 22, 2016) - Robert Friedland, Executive Chairman of Ivanhoe Mines (TSX:IVN), and Lars-Eric Johansson, Chief Executive Officer, today announced assay results from another sixteen holes of the ongoing 2016 drilling campaign at the Kakula Discovery on the company's Tier One Kamoa Copper Project, near the mining centre of Kolwezi in the Democratic Republic of Congo (DRC). The Kamoa Project is a joint venture between Ivanhoe Mines and Zijin Mining. "Kakula is continuing to demonstrate that it is substantially richer, thicker and more consistent than other mineralization that we have found elsewhere on the Kamoa Project," said Mr. Friedland. 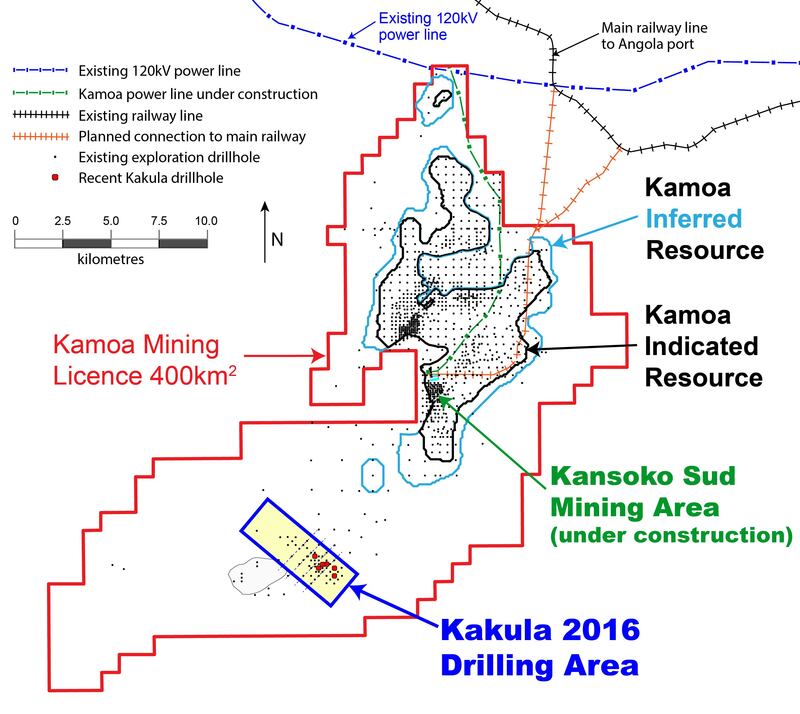 "Given the consistent and thick intercepts at shallow depths of very-high-grade copper mineralization, Kakula is quickly becoming a key focus in our planning for the development of the Kamoa Project." 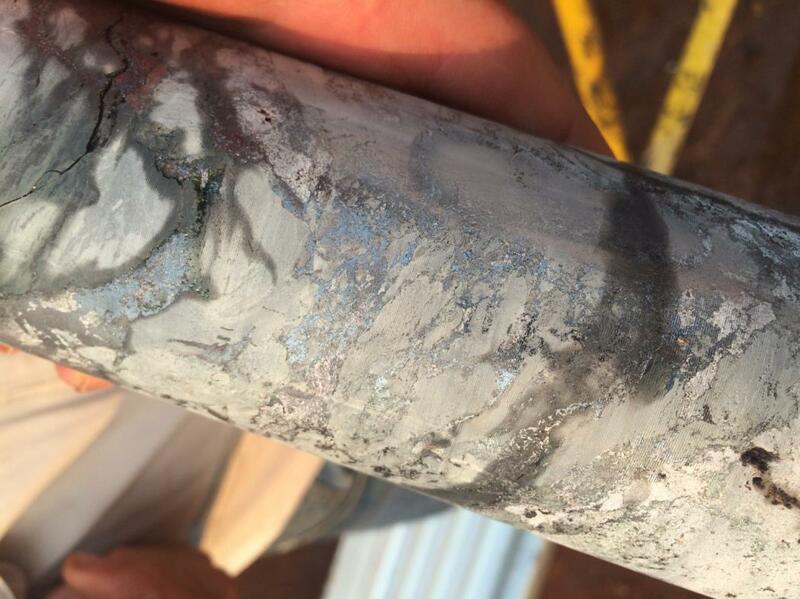 DD1024 intersected 6.14 metres (true width) of 6.52% copper at a 3.0% copper cut-off, beginning at a downhole depth of 312.0 metres; 8.21 metres (true width) of 5.58% copper at a 2.5% copper cut-off; 12.99 metres (true width) of 4.34% copper at a 2.0% copper cut-off; and 14.42 metres (true width) of 4.10% copper at a 1.0% copper cut-off. DD1036 intersected 5.48 metres (true width) of 6.90% copper at a 3.0% copper cut-off beginning at a downhole depth of 274 metres; 7.38 metres (true width) of 5.77% copper at a 2.5% copper cut-off; 13.05 metres (true width) of 4.31% copper at a 2.0% copper cut-off; and 13.99 metres (true width) of 4.13% copper at a 1.0% copper cut-off. DD1039 intersected 11.91 metres (true width) of 6.23% copper at a 3.0% copper cut-off beginning at a downhole depth of 332 metres; 17.87 metres (true width) of 5.08% copper at a 2.5% copper cut-off; 18.56 metres (true width) of 4.98% copper at a 2.0% copper cut-off; and 20.55 metres (true width) of 4.65% copper at a 1.0% copper cut-off. DD1041 intersected 4.04 metres (true width) of 7.39% copper at a 3.0% copper cut-off beginning at a downhole depth of 615 metres; 4.80 metres (true width) of 6.63% copper at a 2.5% copper cut-off; 6.70 metres (true width) of 5.42% copper at a 2.0% copper cut-off; and 13.36 metres (true width) of 3.37% copper at a 1.0% copper cut-off. DD1043W1 intersected 4.21 metres (true width) of 9.44% copper at a 3.0% copper cut-off beginning at a downhole depth of 346.74 metres; 4.89 metres (true width) of 8.48% copper at a 2.5% copper cut-off; 12.50 metres (true width) of 4.69% copper at a 2.0% copper cut-off; and 15.24 metres (true width) of 4.09% copper at a 1.0% copper cut-off. DD1045 intersected 8.44 metres (true width) of 6.96% copper at a 3.0% copper cut-off beginning at a downhole depth of 505.22 metres; 9.31 metres (true width) of 6.59% copper at a 2.5% copper cut-off; 11.44 metres (true width) of 5.81% copper at a 2.0% copper cut-off; and 13.94 metres (true width) of 5.03% copper at a 1.0% copper cut-off. DD1047 intersected 7.90 metres (true width) of 8.85% copper at a 3.0% copper cut-off beginning at a downhole depth of 359 metres; 8.89 metres (true width) of 8.17% copper at a 2.5% copper cut-off; 14.37 metres (true width) of 5.89% copper at a 2.0% copper cut-off; and 21.28 metres (true width) of 4.47% copper at a 1.0% copper cut-off. The consistent, bottom-loaded nature of Kakula mineralization supports the creation of selective mineralized zones at cut-offs of between 1.0% and 3.0% copper, and potentially higher. 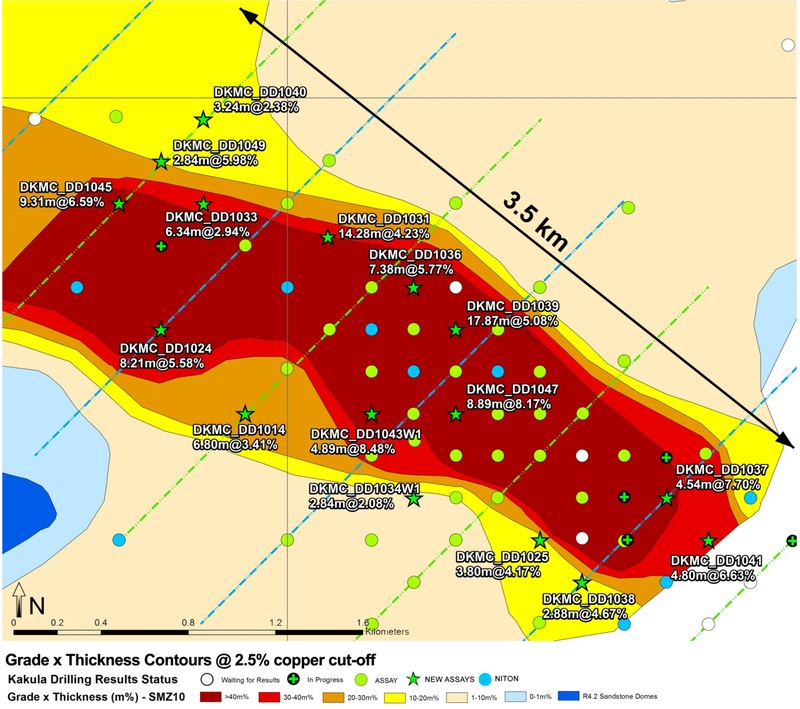 The recent assay results are shown at various cut-offs in Table 1, while the accumulation of copper and thickness of mineralized intercepts at 1.0%, 2.5% and 3.0% cut-offs are shown in figures 5 through 8. The Kakula copper mineralization displays vertical mineral zonation from chalcopyrite (approximately 35% copper) to bornite (approximately 63% copper) to chalcocite (approximately 80% copper), with the highest copper grades associated with the siltstone unit consistently characterized by chalcocite-dominant mineralization (see Figure 4 for strip-logs showing typical Kakula-style mineralization in holes DD1047 and DD1039). Chalcocite (copper sulfide, Cu2S) is high-tenor mineral that is opaque and dark-gray to black with a metallic lustre (see figures 1 and 3 for examples of high-grade chalcocite drill core from Kakula). Due to its very high percentage of contained copper by weight (the tenor, the percentage of the mineral that is actual metal to be extracted, is 80% copper by weight) and its capacity to produce an exceptionally clean, high-grade concentrate, chalcocite is considered to be the most valuable copper mineral. To view Figure 1. 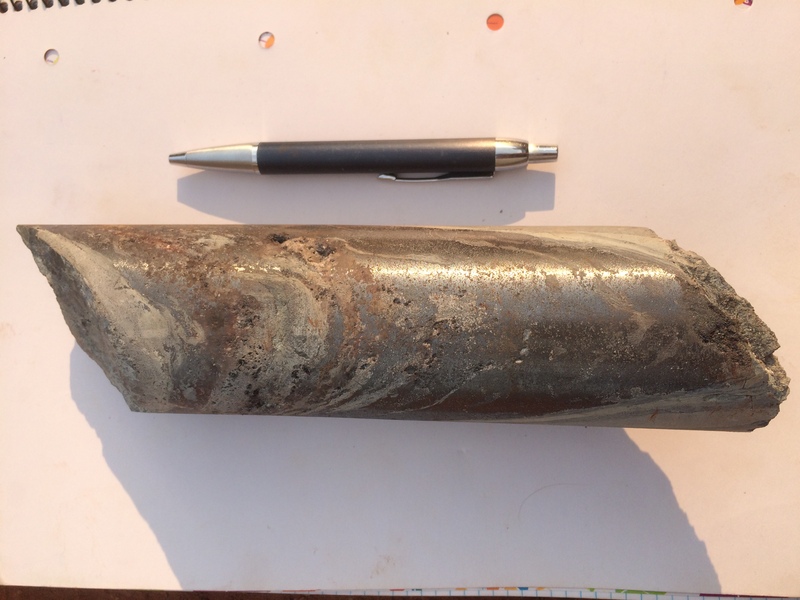 Drill core from DD1041 with disseminated chalcocite in diamictite at a depth of 619 metres (chalcocite is approximately 80% copper by weight), please visit http://media3.marketwire.com/docs/1070266f1.jpg. 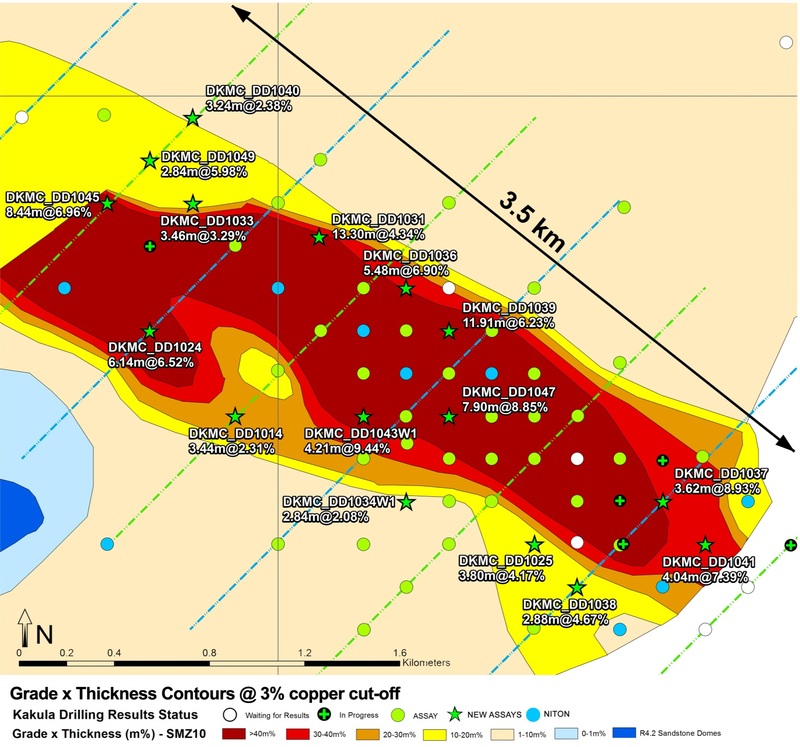 The Kakula Discovery remains open along a northwesterly-southeasterly strike, while high-grade copper mineralization has been outlined along a corridor that now is at least 3.5 kilometres in length. The high-grade copper zone is less than 300 metres below surface in the central section, and gently dips to the southeast and northwest. A total of seven rigs are drilling at Kakula. Two rigs are drilling step-out holes to the southeast of Kakula's currently defined high-grade core, looking to extend the high-grade mineralization beyond the current 3.5-kilometre strike length. Two other rigs are drilling step-out holes further to the northwest to test the possible extension of the high-grade core. Two additional rigs are drilling in-fill holes and one is drilling a large-diameter core hole for the second phase of metallurgical test work. The initial metallurgical test results received in July 2016 from a sample of drill core from the Kakula Discovery zone achieved copper recoveries of 86% and produced a copper concentrate with an extremely high grade of 53% copper. The July results also indicated that material from Kamoa's Kakula and Kansoko zones could be processed through the same concentrator plant, which would yield significant operational and economic efficiencies. Earlier metallurgical testwork indicated that the Kamoa concentrates contain arsenic levels of approximately 0.02%, which are extremely low by world standards. Given this critical competitive marketing advantage, Kamoa's concentrates are expected to attract a significant premium from copper-concentrate traders for use in blending with concentrates from other mines. The Kamoa concentrates will help to enable high-arsenic concentrates from mines in Chile and elsewhere to meet the limit of 0.5% arsenic imposed by Chinese smelters to meet China's new environmental restrictions. Approximately 27,000 metres of drilling has been completed since the current Kakula drilling program began earlier this year. The initial plan was to drill a total of approximately 34,000 metres in 2016. However, given the outstanding success of the program, plans are being developed to expand the 2016 drill program and extend it into 2017. Kamoa Copper intends to prepare an initial independent Mineral Resource estimate for the Kakula Discovery in early October, 2016. Results for nine holes remain outstanding that will be included in the estimate. Amec Foster Wheeler, of Reno, Nevada, has been engaged to oversee the estimate. 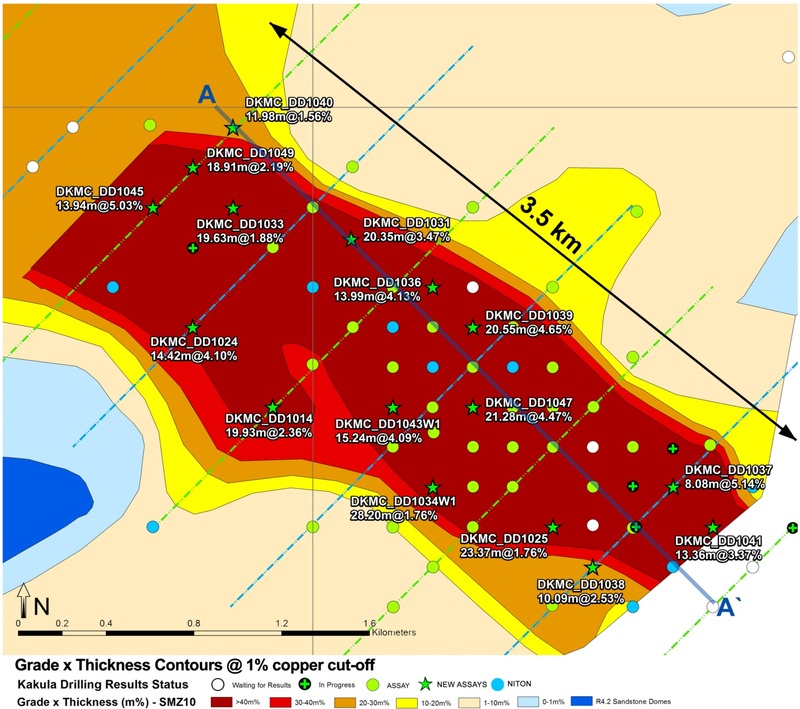 The main objective of the current drilling program at Kakula is to confirm and expand the thick, flat-lying, bottom-loaded zone of very-high-grade, stratabound copper mineralization at the southern part of the Kakula Discovery area (see Figure 2) that has the potential to be amenable to bulk, mechanized mining and therefore could have a significant, positive impact on the Kamoa Project's future development plans. The 60-square-kilometre Kakula exploration area is approximately 10 kilometres southwest of Kamoa's planned initial mining area at Kansoko Sud. To help advance the ongoing evaluation of Kakula, the Kamoa technical team is proceeding with the engineering and preparation of tender documents for the construction of a box cut at Kakula to accommodate decline ramps that will provide underground access to the deposit. A preferred site for the box-cut development has been chosen and geotechnical work has begun. To view Figure 2. Kamoa Project map shows the planned initial mining area at Kansoko Sud and the adjacent Kakula exploration area, please visit http://media3.marketwire.com/docs/1070266f2.jpg. To view Figure 3. Intercept from DD1055, an in-fill hole in the north-west of the Kakula Discovery, with massive chalcocite at a depth of 347 metres (chalcocite is approximately 80% copper by weight), please visit http://media3.marketwire.com/docs/1070266f3.jpg. To view Figure 4. Strip-logs of drill holes DD1047 and DD1039 showing typical Kakula-style mineralization, please visit http://media3.marketwire.com/docs/1070266f4.pdf. To view Figure 5. Kakula Discovery Area. Drill-hole location plan for the Kakula Area shows holes completed and in progress, superimposed on 1% composite grade thickness contours, please visit http://media3.marketwire.com/docs/1070266f5.jpg. To view Figure 6. Recent assay results at a 1.0 % copper cut-off, please visit http://media3.marketwire.com/docs/1070266f6.jpg. To view Figure 7. Recent assay results at a 2.5% copper cut-off, please visit http://media3.marketwire.com/docs/1070266f7.jpg. To view Figure 8. Recent assay results a 3.0% copper cut-off, please visit http://media3.marketwire.com/docs/1070266f8.jpg. To view Figure 9. 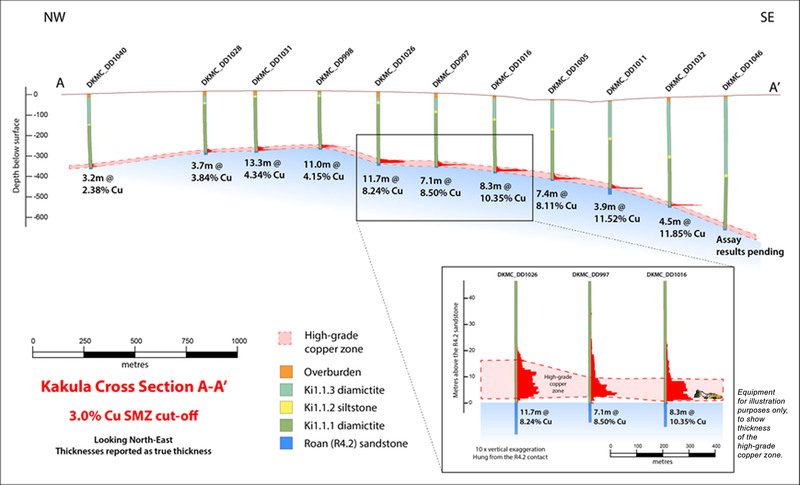 New cross-section A-A' of Kakula Discovery area, showing true thicknesses of drill intercepts at a 2.5% copper cut-off, please visit http://media3.marketwire.com/docs/1070266f9.jpg. To view Figure 10. New cross-section A-A' of Kakula Discovery area, showing true thicknesses of drill intercepts at a 3.0% copper cut-off, please visit http://media3.marketwire.com/docs/1070266f10.jpg. To view Table 1. Assay composites from newly released Kakula drill holes at various copper cut-offs, please visit http://media3.marketwire.com/docs/1070266t1.pdf. To view Table 2. Collars of completed drill holes, please visit http://media3.marketwire.com/docs/1070266t2.pdf. The Kamoa Copper Project, a joint venture between Ivanhoe Mines Ltd. and Zijin Mining Group Co., Ltd., is a very large, stratiform copper deposit with adjacent prospective exploration areas within the Central African Copperbelt, approximately 25 kilometres west of the town of Kolwezi and about 270 kilometres west of Lubumbashi. The Kamoa mining licence covers approximately 400 square kilometres. Kamoa is the world's largest, undeveloped, high-grade copper deposit. On February 23, 2016, an updated Mineral Resource estimate was issued for the Kamoa Project. Kamoa's Indicated Mineral Resources presently total 752 million tonnes grading 2.67% copper and containing 44.3 billion pounds of copper at a 1.0% copper cut-off grade and minimum thickness of three metres. In addition to the Indicated Resources, the updated estimate included Inferred Mineral Resources of 185 million tonnes grading 2.08% copper and containing 8.5 billion pounds of copper, also at a 1.0% copper cut-off grade and a minimum thickness of three metres. The initial independent Mineral Resource estimate for the Kakula discovery, which is expected to be issued in early October, 2016, will be in addition to the Indicated and Inferred Mineral Resources announced on February 23, 2016. 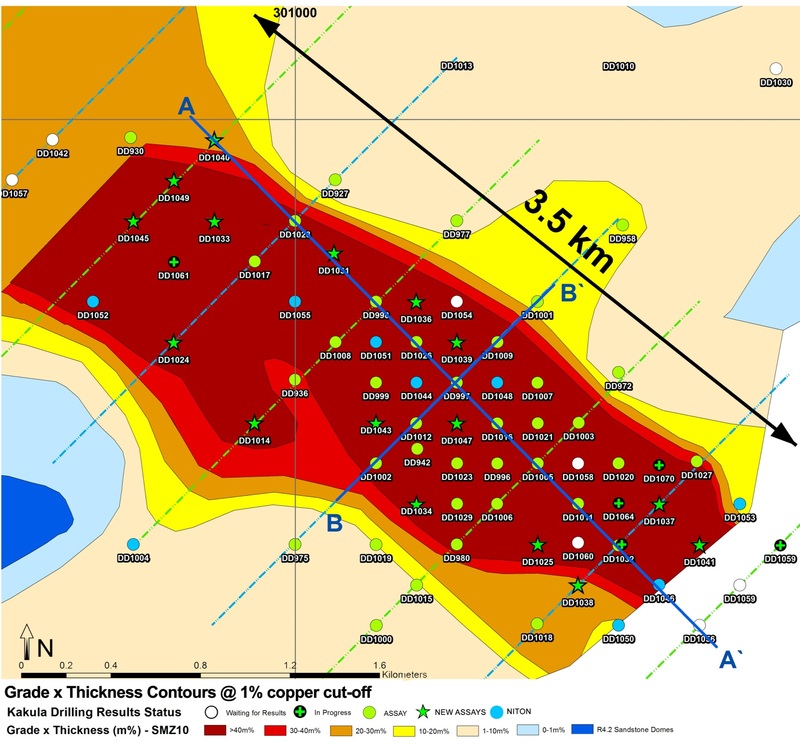 Ivanhoe Mines is advancing its three principal projects in Sub-Saharan Africa: Mine development at the Platreef platinum-palladium-gold-nickel-copper discovery on the Northern Limb of South Africa's Bushveld Complex; mine development and exploration at the Kamoa Copper Project - which includes the remarkable Kakula high-grade copper discovery - on the Central African Copperbelt in the DRC; and upgrading and exploration at the historic, high-grade Kipushi zinc-copper-lead-germanium mine, also on the DRC's Copperbelt. For details, visit www.ivanhoemines.com. Certain statements in this release constitute "forward-looking statements" or "forward-looking information" within the meaning of applicable securities laws, including without limitation, the timing and results of: (1) statements regarding the Kakula Discovery being a key focus in the planning for the development of the Kamoa Project; (2) statements regarding the expectation to have an initial independent Mineral Resource estimate prepared for the Kakula Discovery in early October; (3) statements regarding the primary objective of the current drilling program is to confirm and expand a thick, flat-lying, bottom-loaded zone of very high-grade copper mineralization at the southern part of the Kakula Discovery area that has the potential to have a significant, positive impact on the Kamoa Project's future development plans; (4) statements regarding the plan to drill approximately 34,000 metres at Kakula this year and extend the program into 2017; (5) statements regarding the high-grade Kakula zone remains open along a southeasterly and northwesterly strike; and (6) statements regarding the expectation that Kamoa's concentrates will attract a significant premium from copper-concentrate traders for use in blending with concentrates from other mines Such statements involve known and unknown risks, uncertainties and other factors which may cause the actual results, performance or achievements of the company, or industry results, to be materially different from any future results, performance or achievements expressed or implied by such forward-looking statements or information. Such statements can be identified by the use of words such as "may", "would", "could", "will", "intend", "expect", "believe", "plan", "anticipate", "estimate", "scheduled", "forecast", "predict" and other similar terminology, or state that certain actions, events or results "may", "could", "would", "might" or "will" be taken, occur or be achieved. These statements reflect the company's current expectations regarding future events, performance and results and speak only as of the date of this release. All such forward-looking information and statements are based on certain assumptions and analyses made by Ivanhoe Mines' management in light of their experience and perception of historical trends, current conditions and expected future developments, as well as other factors management believe are appropriate in the circumstances. These statements, however, are subject to a variety of risks and uncertainties and other factors that could cause actual events or results to differ materially from those projected in the forward-looking information or statements including, but not limited to, unexpected changes in laws, rules or regulations, or their enforcement by applicable authorities; the failure of parties to contracts to perform as agreed; social or labour unrest; changes in commodity prices; unexpected failure or inadequacy of infrastructure, or delays in the development of infrastructure, and the failure of exploration programs or other studies to deliver anticipated results or results that would justify and support continued studies, development or operations. Other important factors that could cause actual results to differ from these forward-looking statements also include those described under the heading "Risk Factors" in the company's most recently filed MD&A as well as in the most recent Annual Information Form filed by Ivanhoe Mines. Readers are cautioned not to place undue reliance on forward-looking information or statements. The factors and assumptions used to develop the forward-looking information and statements, and the risks that could cause the actual results to differ materially are set forth in the "Risk Factors" section and elsewhere in the company's most recent Management's Discussion and Analysis report and Annual Information Form, available at www.sedar.com. This news release also contains references to estimates of Mineral Resources. The estimation of Mineral Resources is inherently uncertain and involves subjective judgments about many relevant factors. Mineral Resources that are not Mineral Reserves do not have demonstrated economic viability. The accuracy of any such estimates is a function of the quantity and quality of available data, and of the assumptions made and judgments used in engineering and geological interpretation, which may prove to be unreliable and depend, to a certain extent, upon the analysis of drilling results and statistical inferences that may ultimately prove to be inaccurate. Mineral Resource estimates may have to be re-estimated based on, among other things: (i) fluctuations in platinum, palladium, gold, rhodium, copper, nickel or other mineral prices; (ii) results of drilling; (iii) results of metallurgical testing and other studies; (iv) changes to proposed mining operations, including dilution; (v) the evaluation of mine plans subsequent to the date of any estimates; and (vi) the possible failure to receive required permits, approvals and licences.